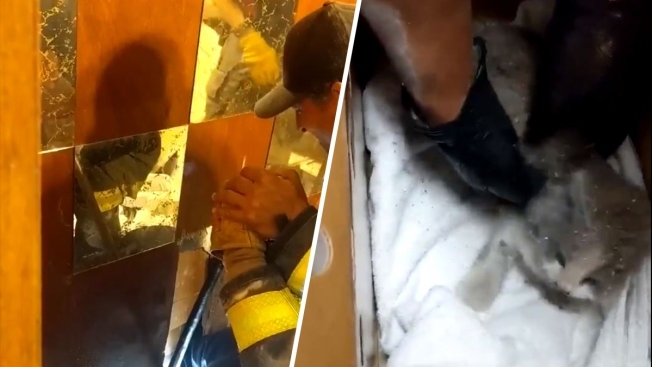 San Francisco firefighters on Friday managed to rescue a kitten that somehow became trapped in a wall for "several days." The rescue took place just before 10 p.m. at a home located along the 1200 block of Sunnydale Avenue, according to firefighters. Footage collected from the scene captured firefighters delicately picking apart the wall in order to reach the young feline. Immediately after being pulled to freedom, the kitten let out an audible meow. How the kitten actually ended up trapped inside the wall remains a mystery, according to firefighters. "The owner of the home did not know how it got in there but was very kind in letting us cut her walls to rescue this tiny life," San Francisco firefighters stated on Twitter. The kitten has since been transferred to San Francisco SPCA, according to San Francisco Animal Care and Control. NBC Bay Area has reached out to the shelter to see how the kitten is doing.